Garnett with Gemstones and Tags. Make this your new favorite necklace. A large Garnett stone encased in 14K Gold Vermeil hangs together with Sterling Oxidized Rings, 14K Gold Filled tag, Turquoise and Mystic Topaz. All hanging from an 18" leather cord with an Aquamarine toggle clasp that knots to shorten. A mellow mix of Iolite, Smokey Topaz, Aquamarine and Sterling make this down to earth necklace elegant. Leather ends with slip knot allow for 18" adjustable to 28". Multiple Gemstone on Sterling and Leather. 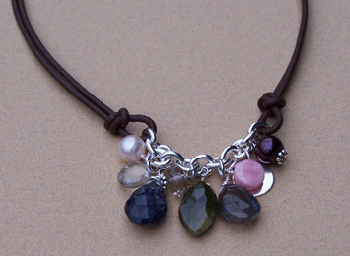 Multiple Gemstones hang alonside a Sterling Charm on a short piece of heavy Sterling Silver chain with leather. Earthy, classy and fun. 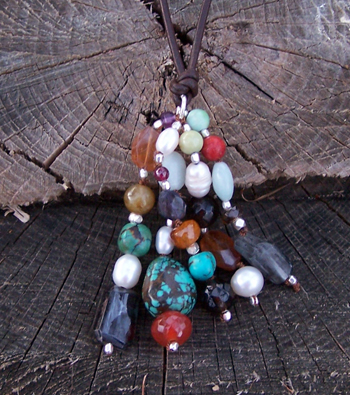 Multiple gemstones hang from brown polished Greek leather cord. Slip knots allow you to adjust from 28" to 16". A Bohemian look that wears well long or short. 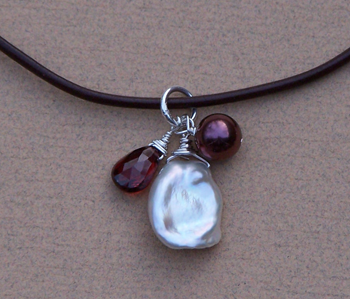 Tahitian Pearl, Keshi Pearl and Gem. A lovely cornflake Keshi Freshwater Pearl hang together with a barrel shaped Tahitian pearl and faceted garnett to sparkle up any wardrobe. Earthy tones make this easy to wear. 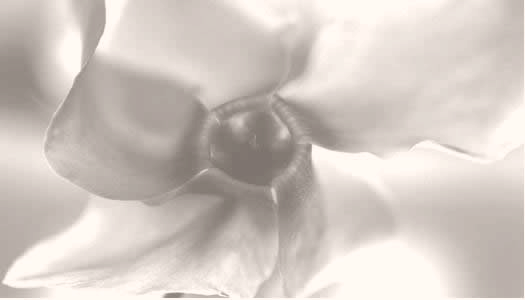 Pearl toggle shortens from 18" to your desired length. 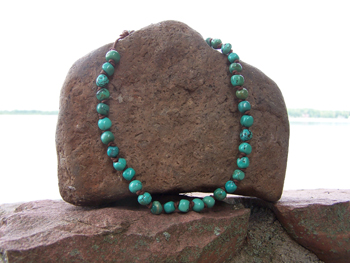 A necklace of solid Turquoise beads strung on leather with a Turquoise bead to tie it off with.